Ludia Inc.’s Jurassic World Alive is a stunning location-based game released for Android and iOS platforms. To save dinosaurs and other pre-historic creatures, you will have to find them via your in-game map and collect their DNA. You can then use DNA to recreate dinos in your laboratory. Turn on your mobile phone’s GPS and tap the in-game map to find out if there are any creatures in your surroundings. Armed with a drone, you will have to track a dino and then extract DNA by shooting darts at him. Don’t worry; it won’t kill the creature – just an in-game way to collect Dino DNA so that you can recreate the same creature in your lab. With the help of the map, you will need to explore your surroundings to discover more dinos. Once you locate a creature, tap him. If he is close to your drone’s range, you can “launch” it to start hunting. To get DNA, you will have to tap, hold and move the crosshairs icon towards a dino to shoot dart. Your goal is to hit the solid white circle on the center that appears on top of a creature to get a “Direct Hit”. If you get one, you will receive max DNA. You will still get some DNA if it hits inside the larger circle but misses the smaller one. Just try to hit the circle and you are good. The drone’s range is shown by a bluish circle on your map. There’s also a battery level indicator on the upper right corner of the screen. If a creature is inside its range, your phone will vibrate. Tap it and you will see full battery levels. This indicates that you will have max time while hunting. You can increase your drone’s range and duration if you become a VIP. With an enhanced drone battery, you can hunt creatures that are out of normal range. You will have to move out of your house if you want to locate new and rare creatures or reach out to those who are pretty far away from your drone’ range. Keep the map open to locate creatures faster. When the creature hunting mission begins, you can easily get maximum DNA on your first hit. This is because the battery levels won’t trigger until you launch your first attack. The creature also does not move, making is easier for you to pull off a Direct Hit. A creature’s speed stat plays an important role in battle as it decides who will get to attack first. A dino with a higher speed value will hit first. Speed also plays a crucial role when you hunt a dino. A creature runs faster when you hit the sweet spot, i.e. the solid white circle. But the speed at which dinos run varies from one creature to the other. 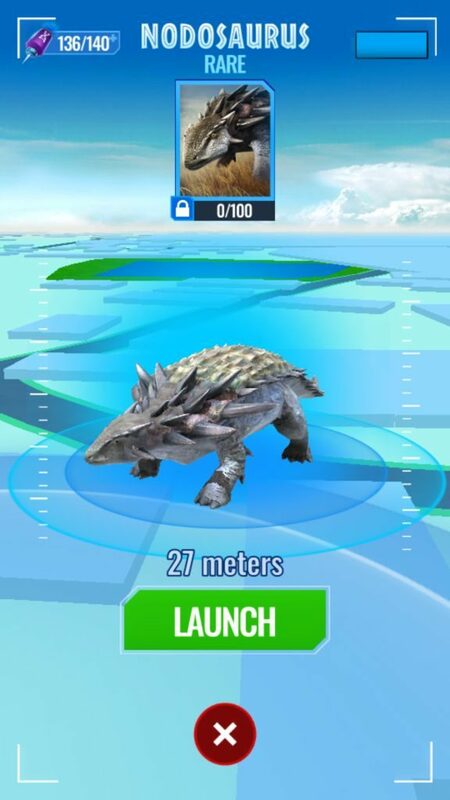 So a Diplocaulus will run faster when hit, but an Einiosaurus will run at almost the same pace when the dart hits the white spot. You will have to be pretty quick while shooting darts at fast-moving creatures and you may miss the target many times. However, it will be easier for you to attack a slow-moving creature like Einiosaurus and you should take full opportunity to attack the smaller circle to get more DNA. So what if you have extracted only 50 DNA from a creature. There’s always a second chance. 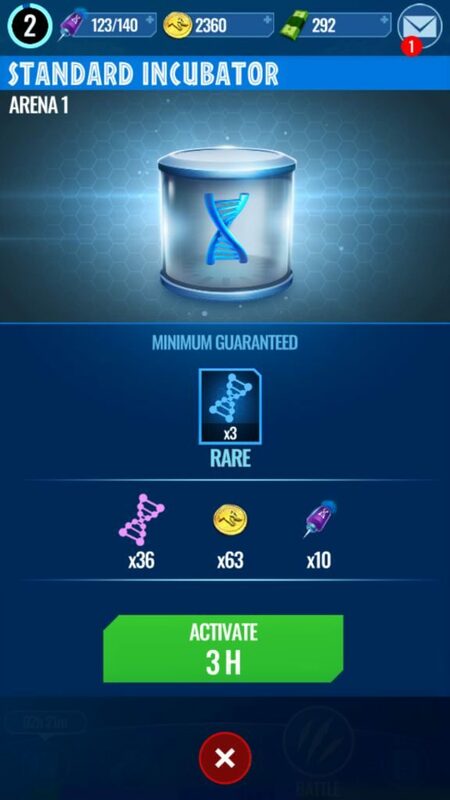 You will need 100 DNA to create a creature in your lab and it may not be possible to get 12 DNA every time you hit a dino. But don’t worry – you may spot the same creature loitering around your area/drone’s range. Tap him and launch your drone to get the remaining DNA. Once you collect to reach the 100 mark, you will be able to create it. 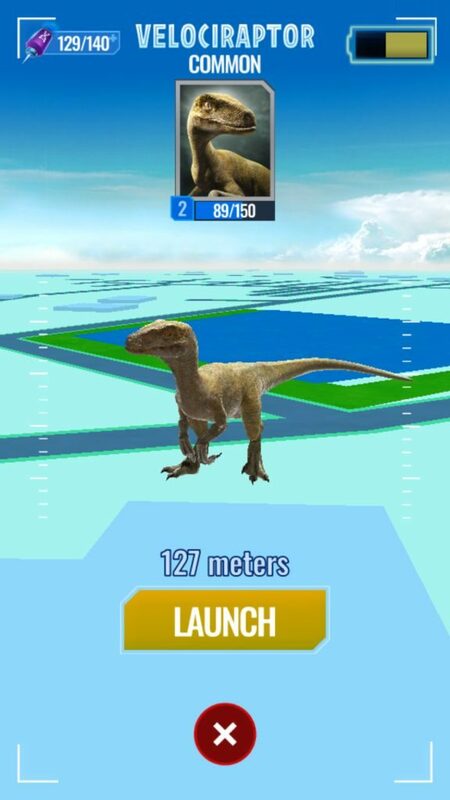 Just tap the Jurassic park logo next to the map and tap the “Create” button. Now that you have unlocked a creature, you should consider evolving him to improve his stats. You will have to extract more DNA from the same creature if you want to make him stronger. If you spot one on your map, don’t ignore and launch another drone attack to collect DNA. Once you get the required number of DNA, it’s time to evolve him. Go to your collection and tap the creature. Tap “Evolve”. You will need coins to make your creature stronger. Once evolved, you will see a boost in key stats such as Damage and Health. 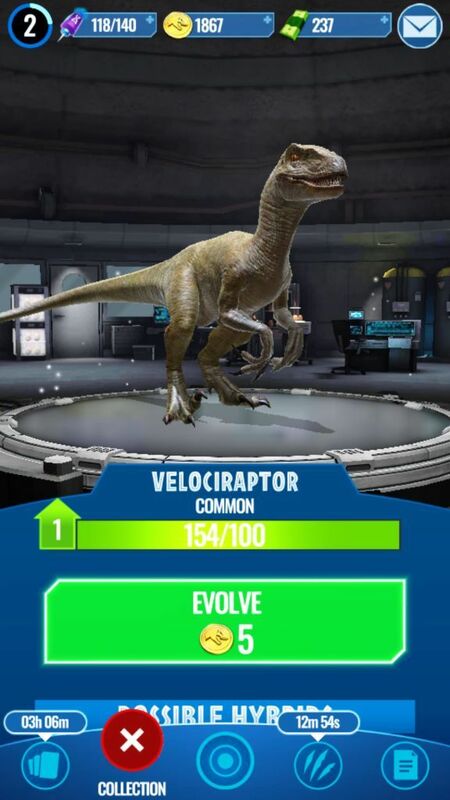 Since Jurassic World Alive chooses 4 random creatures from your collection in a battle, you should make sure that every creature in your team is evolved. You never know which creature appears in your team of 4 when you battle a random opponent. So it’s very important to have all evolved creatures in your team. Another way to discover and upgrade creatures is to receive DNA from incubators. You can get one free incubator every 6 hours. It contains DNA for a random creature. You will also receive incubators as arena battle rewards on winning PvP battles. You may receive a standard or large incubator. Large incubators contain guaranteed 9 DNA for a random rare dino and DNA for a specific dinosaur. You will also receive around 100 common DNA, coins and darts. Standard incubators contain 3 guaranteed rare DNA and around 36 common DNA for a random creature. When you receive a battle reward, don’t forget to activate it. You can speed up an incubator’s time using cash, which you can earn for free by tapping its icon on the top of the screen. You will have to complete certain offers such as installing an app, playing a web game, completing certain levels in another game (you will have to install that game and follow the instructions on the offer screen to get free cash).